Using Steamers to Control Bed Bugs | Let's Beat the Bed Bug! Steam is a very effective method for killing bed bugs in all the stages of development, if applied correctly. When using steam as a treatment the quality of the steamer is very important. Use a commercial steamer with a minimum capacity of 1 gallon, preferably with a steam volume control. The type of steamer you use to steam clothing will not be effective for bed bug treatment. Do not use a carpet cleaning machine. Carpet cleaning machines do not reach high enough temperatures to kill bed bugs. Although a steam cleaner is expensive for one person to purchase (approximately $800 to $1,200), it may be reasonable for a housing cooperative, a social assistance group or another type of organization to purchase a steamer and make it available for members to use. It may also be possible to rent a steamer. Steamers work by delivering lethal temperatures to where bed bugs may be hiding. Steam is very effective when bed bugs are on the surface of items and can be effective up to 3/4″ into fabric surfaces. In cracks and crevices, steam will kill bed bugs up to 2-3/8” into a gap. 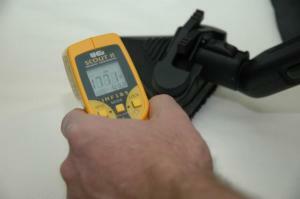 Use an infrared thermometer to monitor the surface temperature of the area being treated. To effectively kill bed bugs the surface temperature should be at least 160-180°F immediately after the steam brush has passed. Attach a nozzle to the steam wand. There is often a triangular nozzle that comes with the steamer and this nozzle works well most of the time. The floor nozzle will also work, but you will have to move the nozzle more slowly to obtain the right temperatures. Surfaces must reach a temperature range of 160-180°F. Below this, bed bugs may survive. Above this range increases the risk of damage to the fabric and other materials. An infrared thermometer should be used to measure surface temperatures after the wand has passed over the area being steamed. If the temperature is too low, move the wand more slowly. If the temperature is too high, move the wand faster. Fabric may be damp, but it should not be wet. If it is too wet, the steamer usually has a switch or a dial that you can use to decrease the amount of steam. Use the steamer on all surfaces where you see bed bugs and areas where you think bed bugs may be hiding. After you are finished, using a fan in the area will circulate air and help dry the items you have steamed. When you are finished, follow the manual instructions for cooling off the steamer and ensuring the pressure is relieved. You may have to repeat this procedure a couple of times as this method only provides control of bed bugs that are exposed to the heat, any bed bugs that do not come into contact with the steam will survive. Always read and understand the manual that came with the steamer. The steam is under pressure, so be careful when refilling the machine and using the steam wand. The steam will be hot, as high as 212-230°F. This can cause burns, so never let children use the steamer and always direct the steam away from yourself. When using steam, always test on an unseen area as some fabrics may be damaged. With microfiber fabrics, always steam with the direction of the microfiber. Steamers will sometimes spit out hot water when you start up, or after the steamer has not applied steam for a while. Pointing the wand at a towel when you first start will allow you to capture this water. Do not use a pin-point steam nozzle; make sure you use a nozzle to distribute the steam at lower pressures such as a floor or upholstery attachment. Pin point nozzles can blow the bed bugs away and they may survive.